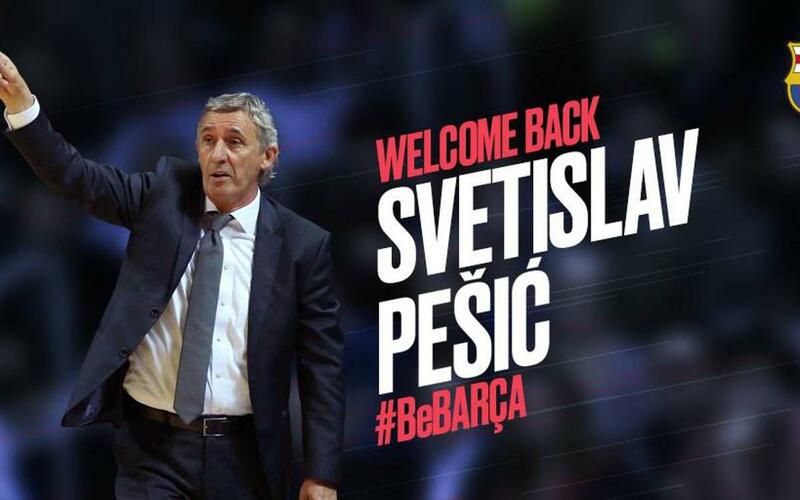 Svetislav Pesic returns to coach Barça Lassa. The 68 year old Serbian coach has reached an agreement with the Club to take the reins until 30 June 2018. This is his second spell in charge at the Palau Blaugrana. Pesic started his first spell as Barça Lassa coach in 2002. With Pesic in charge Barça claimed their very first ever Euroleague title in 2003 with the Final Four being played in the Palau Sant Jordi. His first season also saw the team claim the ACB League title and the Copa del Rey. In 2003/04 Barça Lassa retained their league title under Pesic. In a press conference to announce his arrival as coach on Friday at the Club, Pesic identified his immediate objectives: "We have to take it step by step, there are a lot of games to go until then of the season and so we have to compete in the Euroleague and finish as high as we possilby can in the ACB League." The new coach revealed himself to "prepared to help my club," in reference to his previous spell at Barça, adding his belief "we have a squad with plenty of experience so now we have to work on our confidence." Svetislav Pesic has vast experience as a coach. He started his career at Bosna Sarajevo (1982-87) before becoming German national team coach until 1993, claiming the European Championship title in that time. From 1993 to 2000 he was in charge at Alba Berlin where he won 4 German league titles, 2 cups and the Korac Cup. From 2000 to 2002 he was national coach for the former Yugoslavia, winning the European Championship in 2001 and the World Championships in 2002. In the 2001-02 season he was coach of Cologne. After his first highly successful stint as Barça coach, the Serbian moved on to coach Virtus Roma (2004-06), CB Girona (2006-07, Dynamod Moscow (2007-08), Crvena zvezda (2008-09 and 2011-12), Valencia (2010-11) and Bayern Munich, his last team from 2012-2016 where he won the German League once again.